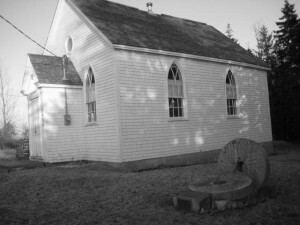 The Anglican community in Cole Harbour started a mission in 1794. At that time and for many years later, the worship and Sunday School were held in several places. Moving from individuals’ homes, to community school, to the farming communities’ hall, which still stands today overlooking the Cole Harbour dyke area, our Anglican community finally acquired land and built our own church building in 1871. This is located at the corner of Cole Harbour Road and John Stewart Drive and is was used regularly for services throughout the week. At the time of construction, we were part of the Parish of St. Peters, Eastern Passage and remained with them until 1950 when we became attached to St. Luke’s, Westphal. In 1957 we again moved to become part of the Parish of Holy Spirit in Dartmouth. During the 1970’s a rapid growth period was experienced in our residential community and the resulting parish needs were addressed on February 3, 1980, when the Diocese assigned a full time priest. Our membership consisted of 113 families and it seemed we were not only finally in control of our own destiny, but the physical and spiritual growth we were experiencing was such that the contemporary service moved to the gymnasium of John Stewart School. The contemporary service, containing guitars, new music and the new Eucharistic rights, attracted a large and very enthusiastic congregation. As a result, it became our main family service of the week. The 8:00am said Eucharist and the 11:00am Book of Common Prayer service continued in the regular church building. With the onslaught of new members, lay participation became a necessity and we saw significant changes in the service with servers, readers and two choirs. Committees responded by becoming very active meeting the needs of our new mission. The Baptism Committee for example, now became involved in heightening the awareness and importance of this Sacrament to all, including instruction to parents, spouses and members to be baptised. Our numbers had reached about 170 identifiable givers by the date of our incorporation, March 1, 1982. Our boundaries were now clearly defined with the mutual consent of our neighbouring parishes and the Bishop. Growth in the area and in our own Christian community continued to escalate. As a result of our members, and the good stewardship of our congregation, we finally adopted a budget, January 1, 1984, free of grants from the Diocese. This meant we reached a self supporting stage of our parish life, a feat which has not been equalled by some of the older, well established parishes in our Diocese. The last significant historical event to date was on November 30, 1984 when we installed our first rector, the Rev. W.G. Lynch.